Criticism over TV production, particularly soap operas, continues in Armenia, however, the TV content undergoes no change. During the recent years a number of artists, psychologists, specialists in conflictology, and even lawmakers have touched upon the content of soap operas (which have huge TV audience and provide TV channels with substantial advertisement profits), demanding to improve their content in order not to harm people’s, especially young people’s psychology. In response to this demand, soap opera producers say that they reflect the real life and do not intend to make heroes out of criminals, but instead they try to bring to light all negative phenomena and morals and manners of public life. According to the weekly monitoring by the Telemediacontrol Company, soap operas (‘Anna’, ‘School of Angels’, ‘On the Other Side of the Edge’, ‘Hard Life’, ‘Dreams’, ‘Full Moon’, etc.) dominate on the list of the most watched TV programs. Another research shows soap operas are watched by half of Armenia’s population. A few months ago, the club of young specialists in conflictology voiced its concerns that the scenes of too much misfortune and sufferings in the lives of soap opera characters (who are either representatives of the criminal world or people having hard life) create a wrong impression about life among TV audience. Specialists in conflictology are also worried that soap operas are full of scenes with sexual, physical and psychological violence. “Such scenarios create an undesirable soap opera identity among TV watchers, making them repeat the behavior presented in soap operas in real life. The long-lasting ‘development’ of people through soap operas creates disabled psychology. Soap operas negatively influence especially the minors, who are more vulnerable in terms of perceiving what they see as a reality. 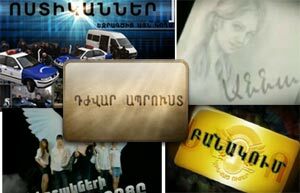 Minors perceive soap opera characters as role models, ‘successfully’ copying their behavior, manner of speech, vocabulary, which mainly tortures the mother tongue,” say specialists in conflictology, addressing to the National Commission on Television and Radio (NCTR), as well as to the Armenian Public Television, Armenia and Shant TV companies, which produce soap operas. Member of the club, specialist in conflictology Astghik Khachatryan tells ArmeniaNow that nothing has been changed so far. “We have received no response from soap opera producing TV companies, the situation has not been changed anyhow, and the scenes of violence have even increased, because soap operas in general have increased,” says Khachatryan. Last year a nine-year-old boy, resident of a village in the northern Tavush province, beat the dog of his co-villager to death and then called its owner, and changing his voice demanded one million drams, otherwise he threatened to do the same with all members of their family. The boy later told the police that he had acted as one of the hidden characters in a soap opera. Expert in IT security Vahram Mirakyan, who is the author of the ‘Formation of Aggressive Social Positions in Mass Media’ research work, told ArmeniaNow that television being an informal educational institution, because of its aggressive content has a dysfunctional influence upon the audience. “The Armenian antisocial, aggressive films and TV programs have even stronger influence upon the audience, because the factor of influence and the target have common culture, language and social reality,” Mirakyan says. Mirakyan in his research studied three soap operas - ‘Anna 2’, ‘Return 2’, ‘Successors’ (the last two are already finished, however, according to Mirakyan, the soap operas, which replace them do not differ from them) - within a month and came to the conclusion that episodes full of aggression and depression essentially prevail over episodes, which are free from aggression and are neutral. As a result, according to Mirakyan, soap operas with such content and trend may bring about language torture, change in language-thinking, when especially schoolchildren start speaking in a special criminal sub-cultural dialect. Besides, the accepted model of family is being mutilated, “because there is general aggression in male-female, child-parent, male-male relations,” Mirakyan explains. “A soap opera about cops is shown in Armenia, where, nevertheless, the criminal world is presented, those people are in the foreground. Even if a criminal is punished in the end, it is not important, the important thing is that throughout the whole soap opera that character serves as a sample of propaganda,” Mirakyan says, adding that the problem is not settled in the West either, however, there at least in police soap operas the image of a police officer is in the foreground, and a criminal is presented less.